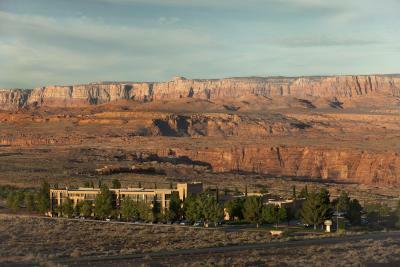 Lock in a great price for Courtyard Page at Lake Powell – rated 8.2 by recent guests! Nice hotel, great staff, good breakfast. Really enjoyed it. Nice pool and hot tub also! Excellent overall, which has been my experience with Marriotts across the US. All staff was friendly and very helpful, Breakfast was fantastic. The place is very nice, good facilities and friendly staff. The room was clean and the bed was comfortable. There was coffeemaker in the room, you can grab water, coffee or tea in the lobby. There are fireplaces at the lobby and in the yard. Also you can have a meal at the Peppers, if you hungry. The place has good location and nice view. The hotel sits atop a hill overlooking a beautiful view. The property was designed in a Navaho look and the nicest property I could find in the area. It was a good value, clean, easy to find from the highway and a safe location. Wonderful hotel! Enjoyed our time there and having Megan be our server at the restaurant. Great Food! Everyone we met was so nice and friendly. Thank you! it is a bonus in our trip. I love the room nice and clean. great view from our balcony, kids love to play at camp fire at central yard, nice and peaceful. a few minutes to downtown Page and Antelope Tour office and Horseshoe Bend. Great location. location, location, location !! Everything we wanted to see was easy to get to. Had a great breakfast for the price. Couldn't be happier. Really nice Hotel. Courtyard Page at Lake Powell This rating is a reflection of how the property compares to the industry standard when it comes to price, facilities and services available. It's based on a self-evaluation by the property. Use this rating to help choose your stay! This hotel has a well-equipped fitness center, an on-site gift shop and spacious rooms with 25” TV. It is less than a mile from Lake Powell National Golf Course. All rooms at Courtyard Page at Lake Powell have comfortable bedding such as fluffy pillows and thick mattresses. Each room has air conditioning, a microwave and cable TV. Courtyard Page provides complimentary coffee and newspapers in the lobby. Guests can also make use of the self-service laundry facilities. Courtyard Page at Lake Powell is a 5-minute drive away from Glen Canyon Dam. Antelope Slot Canyons is less than one mile away. When would you like to stay at Courtyard Page at Lake Powell? Features cable TV with the HBO movie channel and a fridge. This room features a canyon view, cable TV with the HBO movie channel and a fridge. Surrounded by the Lake Powell Golf Course, the Courtyard Page at Lake Powell, AZ overlooks Arizona's breathtaking Glen Canyon and is one of the most convenient hotels to Lake Powell and the Colorado River. House Rules Courtyard Page at Lake Powell takes special requests – add in the next step! Courtyard Page at Lake Powell accepts these cards and reserves the right to temporarily hold an amount prior to arrival. There was the problem with the changing out of mattresses, They left all bed frames out in the lawn and a stack of old mattresses piled up on the lawn and they were right in our view all weekend. which was pretty annoying to look at. Very loud people in the room upstairs--and next to ours. Walls and ceilings are obviously not insulated. Very unpleasant nights as a consequence (one travels to the South-West to be in touch with nature, not with human-made cacophony). Fine hotel, very reasonably priced. No elevators. We had luggage’s. H/ vac unit in room was so loud an cycled on/off every 5 min. we were unable to sleep had 5 nights left after two. they were not able to move to another room. upon leaving I over heard another guest complaining about the same issue. this is a older hotel and should not be allowed to use the courtyard brand name. I 'm still waiting for a refund for 3 nights. I think the hotel needs some updates to the rooms to elevate it to its full potential. Staff not as professional as I would have expected. Our room had an odor like someone had smoked in it. Room was dated. The king bed was really comfortable. Property didn’t have the luggage storage service. Room fine but bathroom very poor. Pool was Closed my kids very disappointed. We had two rooms, o ff room smelled bad. One room had a pocket door to the bathroom. Didn't seem like a Marriott property. Upon leaving the hotel my son rolled his ankle the cement ended and had uneven stepping stone blocks.